'Kimparo', the James Alexander Scrymser residence designed by Trowbridge & Livingston c. 1899 in Seabright, New Jersey. Scrymser was President of the Central and South American Cable Company and the Mexican Telegraph Company. In 1861 Scrymser enlisted in the 12th New York Regiment and after serving as a Lieutenant in the 43rd New York Volunteer Regiment was promoted to Captain and served as an aid with the Sixth Army Corps, taking part in all of the battles of the Union Army until 1864. Following the war he was a pioneer in the telegraph industry connecting the United States with Central and South America, eventually laying a total of 14,300 miles of cable and 2,500 miles of land wires. 'Kimparo' escaped severe damage during a storm in 1914 that apparently destroyed many of Scrymser's neighbor's residences. It is unknown if the house in extant. 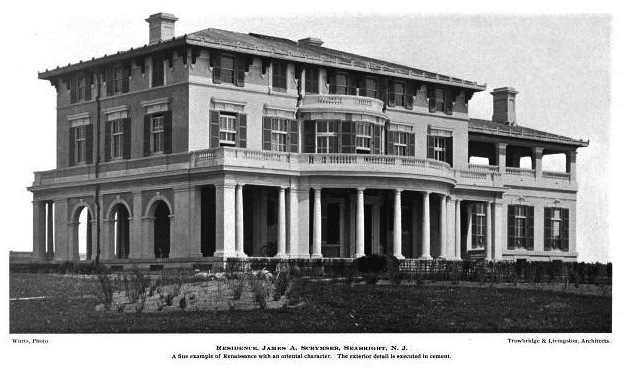 Photo from Architecture, 1900. I love their work. They always reminded me of Delano & Aldrich.